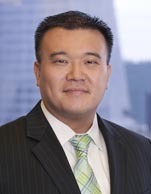 Ji Woon Kim is a Shareholder in the New York office of Vedder Price and a member of the firm’s Global Transportation Finance team. Mr. Kim represents and advises international and domestic lenders, export-credit agencies, borrowers, lessors, lessees, operators, charterers, trustees and others in a variety of maritime and maritime finance transactions, as well as other transportation finance matters, including transactions structured as cross-border leveraged leases, mortgage financings, warehouses, revolving credit facilities, export-credit-agency-supported financings, bareboat charter financings, operating lease financings, sale and leasebacks and capital markets transactions involving vessels and other marine assets. Mr. Kim obtained his B.A. from the University of Chicago and his J.D. from the University of Illinois College of Law.